Do small businesses consider search engine optimization (SEO) a relevant and useful digital marketing effort? How are small businesses strengthening their presence on search engines? Clutch surveyed 355 US small business owners and managers to investigate how they typically approach SEO. We found that small businesses, while increasingly embracing SEO as a digital marketing tactic, leave something to be desired in the space. Small businesses are investing more in SEO. 52% percent invested in SEO in 2016, a number that will grow to 74% in 2017. Small businesses are also increasing investment in pay-per-click (PPC) advertising. A total of 65% will carry out a PPC campaign in 2017, up from 40% in 2016. Small businesses prioritize local search and on-site optimization as their primary SEO activities (52% each). Website traffic from search engines is the metric used by most small businesses to measure SEO effectiveness (56%). 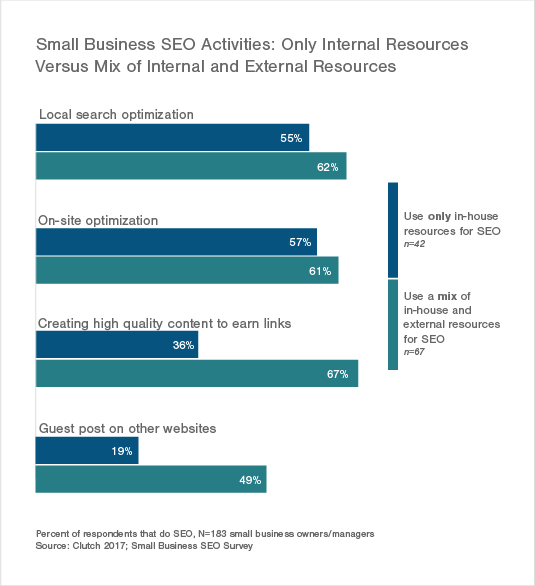 A majority (60%) of small businesses depend on internal resources for SEO over external resources, like an agency or SEO software. Overall, SEO efforts among small businesses are largely subject to external factors, particularly the resources at their disposal and their understanding of SEO as part of a larger marketing strategy. More small businesses will embrace SEO as part of their digital marketing strategy in 2017 and beyond. Over half (52%) of small businesses invested in SEO in or before 2016, and an additional 22% say they plan to in 2017. 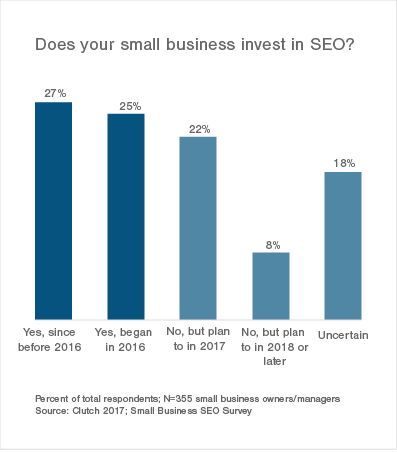 The projected increase in SEO investment counts the third consecutive year that small businesses indicate plans to expand their SEO efforts, according to previous research from Clutch. Despite more small businesses embracing SEO, they remain behind the ball, according to John Lincoln, CEO of Ignite Visibility, a San Diego-based SEO company. For Lincoln, the absence of wide-scale adoption of SEO represents small businesses lacking an understanding of the benefits SEO can provide, such as increased traffic and revenue. Small businesses are warming to PPC at an even more rapid pace than to SEO. While only 40% carry out PPC campaigns currently, and an additional 25% expect to in 2017. Moreover, nearly 60% of small businesses that actively carry out PPC campaigns do so on a consistent basis. 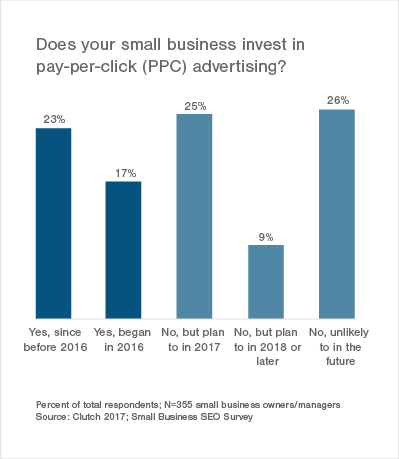 That being said, more than one-fourth (26%) of small businesses remain unlikely to invest in PPC as a digital marketing effort in the future. One explanation for resistance has to do with the paid aspect of PPC. Compared to organic SEO, which has no transactional cost, paying for PPC campaigns is a tough sell for some small businesses, especially since 50% of the businesses surveyed have total annual revenue of less than $1 million. PPC provides an opportunity for small businesses to remarket their brand and content to audiences that they know have previously engaged with their digital platforms, a group who also happen to be the most likely to bring in revenue. For small businesses, deciding which activities to direct their focus and resources is the first step of formulating an SEO strategy. Given that most small businesses operate on a local level, it is no surprise that a majority of small businesses (52%) prioritize local search optimization. 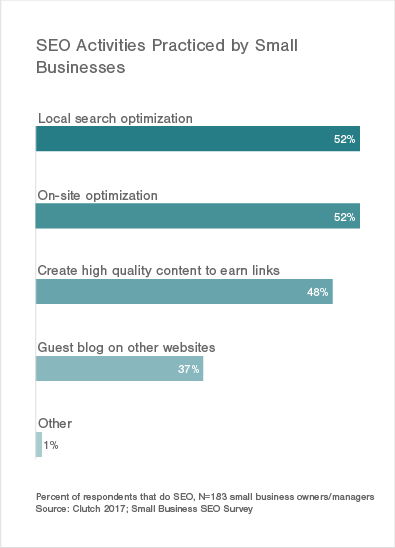 Small businesses favor local and on-site optimization tactics over other SEO activities, like creating high-quality content or guest blogging. Without anything driving them to market themselves outside of a local radius, and with limited resources to do so, small businesses focus on building a local audience. Experts say that because of their limited resources, small businesses should direct their resources more toward content creation, as opposed to local and on-site optimization. “Since SEO is resource-intensive, a better strategy is dedicating time to crafting great site content, not necessarily an army of backlinks,” Reid said. Reid’s suggestion aligns with consensus from within the SEO community, which agrees that creating high-quality content can provide a solid cornerstone for a more effective SEO strategy. Of course, one activity in isolation will not act as the magic bullet for small business SEO. Instead, quality content can play a seminal role as part of a larger, more comprehensive SEO strategy which can work to boost site search performance and increase traffic or revenue to a company's digital platforms. “A comprehensive SEO strategy involves a multitude of disciplines including technical SEO, on-page optimization, outreach, and content creation,” said Stephen Jeske, Senior Content Strategist for CanIRank, an SEO software vendor. Creating high-quality content assets may be a particularly productive SEO activity for small businesses but can provide even better search results when combined with other activities. 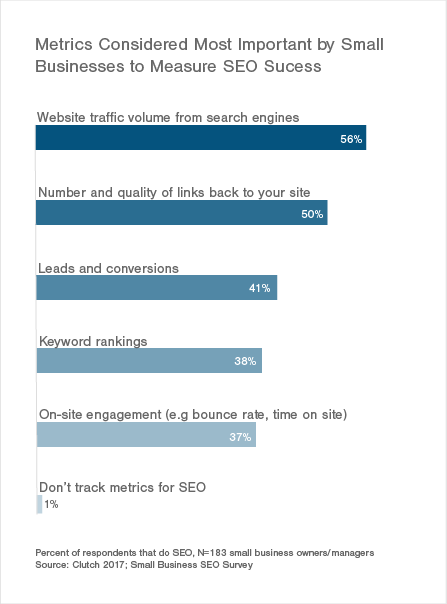 The metrics that small businesses most commonly track to measure the success of their SEO efforts provide further evidence that they have yet to develop a comprehensive understanding of the space. Small businesses study traffic from search engines (56%) the most to measure the effectiveness of their SEO efforts. One in two (50%) track the quantity and quality of backlinks to their site. Small businesses’ focus on backlinks, and their metric priorities in general, may be solely based on how easy they are to measure. “I would assume that maybe small businesses are keen on tracking backlinks because it's something they can track. But I have a hard time believing it's giving a lot of value,” said Chad Reid of Jotform. To Reid’s point, there are a number of free online tools, such as Moz and Google Analytics, which require minimal ability to operate and allow for small businesses to easily access their website’s link profile and traffic. In addition to traffic and referrals, industry experts stress that small businesses should expand the type of metrics they measure to include larger business concerns, like leads and conversions, as well as performance for target keywords. Aaron Wittersheim, COO of Straight North, qualifies all SEO tactics as subordinate to tracking sales leads and e-commerce revenue and is clear in his view that small businesses are missing out on opportunities in the SEO space. For Michael Mignogna, CEO of Minyona, a boutique Baltimore-based SEO and marketing firm, the focus on backlinks reveals a disconnect between small businesses' SEO efforts and the ultimate goal of SEO, which is to be found online for your target audiences’ organic search queries. Minyona adds to the chorus of voices in the industry that emphasize integrating various SEO efforts, such as creating content, getting backlinks, and optimizing on-site features, in order to formulate an effective strategy. Small businesses primarily rely on in-house staff as their main SEO resource. However, we found that those that use a combination of in-house and external resources tend to display the most comprehensive SEO strategies. Currently, 60% of small businesses use in-house staff, compared to 40% that use a freelancer or consultant, 34% that use SEO software and tools, and 30% that use an agency. The resources used by small businesses for SEO, more so than other key elements of an SEO strategy, have a direct impact on small businesses' overall approach. For example, small businesses that use in-house resources in conjunction with external resources are more likely practicing a variety of SEO activities than those that solely rely on in-house resources. Small businesses that use in-house resources focus primarily on local and on-site optimization for their SEO activities. This pales in comparison to those that use a mix of internal and external resources, at least 49% of which invest in local search optimization, on-site optimization, content creation, and guest posting – every activity measured in our research. John Lincoln reasons that small businesses that use a combination of resources recognize the limits of in-house SEO. Having an outside expert act as a teaching resource for your in-house team, in addition to carrying out particular SEO activities, both enhances the effectiveness of SEO efforts and establishes a culture of learning. Through this process, an in-house team has the opportunity to understand SEO strategy better and to direct it going forward. Clutch conducted a survey of 355 small businesses to examine how they approach SEO. 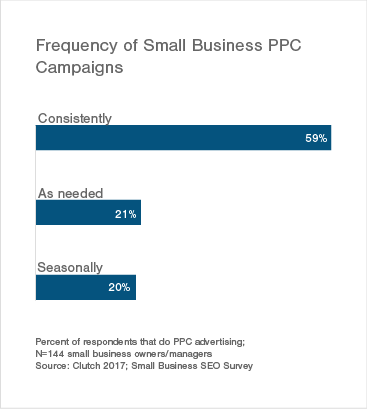 Our findings indicate that while small businesses are warming to both SEO and PPC investments, they do not yet have a complex understanding of the space nor do they invest significant resources in SEO. As a result of these factors, small businesses typically don’t have comprehensive SEO strategies. First, small businesses should expand the breadth of their SEO strategies, both in the tactics they choose to pursue and the metrics they choose to track. Integrating multiple efforts as part of a single strategy lends itself to optimal search performance for small businesses. Second, small businesses should make content creation their primary SEO priority, in addition to giving leads and conversions more precedent as metrics to measure the success of their SEO efforts. 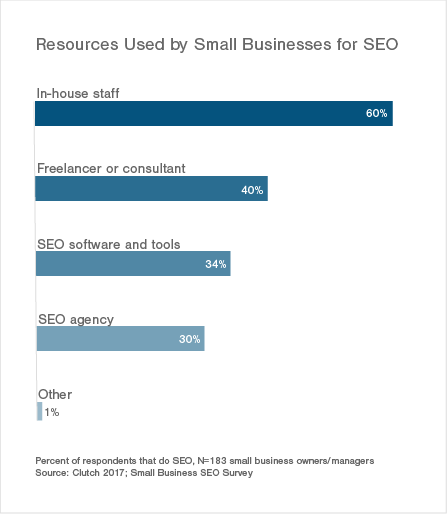 Third, small businesses should use both in-house and external resources for SEO. This yields a more comprehensive and effective SEO strategy. Clutch surveyed 355 small business owners and managers to investigate how small businesses approach SEO as part of its 2017 Small Business Digital Marketing Survey. The small businesses surveyed have between 1-500 employees. 42% have fewer than 10 employees, while 50% have revenue under $1 million per year. *Note: Some percentages in the graphs above may not add up to 100% due to rounding error.